Having had no safe opportunities for photography at this Famed Mosque and leaving it to a later date we move on to the Fayuansi or the Buddhist Temple of the Source of the Law. Moving more East-ward, through increasingly smaller lanes in the Xuanwu area and into the Cozy and Chinese looking JiaoZi Hutong, we come across this obviously Islamic Building in the middle of Chinese-styled Hutong. 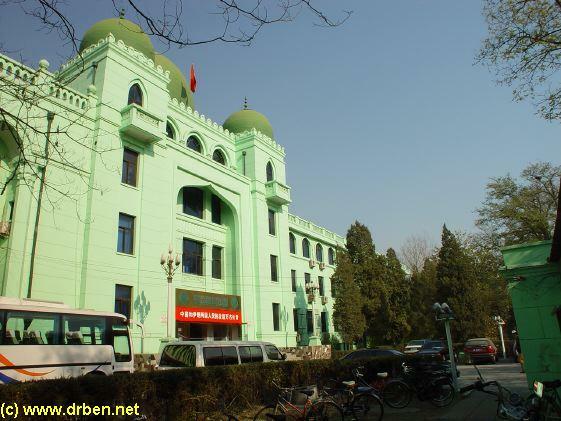 Located on one of the main streets of JiaoZi Hutong this is the Chinese Headquarters and administrative Building of the Hui Islamic Ethnic Minority Group. The Hui are one of China's 56 ( official ) Ethnic Minority Groups, and have a Muslim background. They are however not similar or related to the Ethnic Turk (Uygur) muslim minority of the Western Province of Xinjiang (= New Territories). The Hui, unlike the Uygurs have long been a part of China and have a history dating back to the beginning of Trade on China's famed Silk Road. It is said that the Hui descend from the earliest Muslim traders on this Route, who settled down having reached China. Their offspring, through countless generations have become known as the Hui, and are now an official Chinese Ethnic Minority. Today the 8.7 million strong Hui Ethnic Minority are widely distributed throughout China's 28 provinces and 5 autonomous regions, but are mainly found in Ningxia Hui Autonomous Region, and Gansu Province in the North-West ( the beginning of the Silk Road as seen from a Chinese perspective). XiÁn, the Capital City of Shaanxi Province is also home to a large Hui population and is famous not only for it's Terracotta Army but also for its Islamic Quarter and the Hui Great Mosque of Xian. 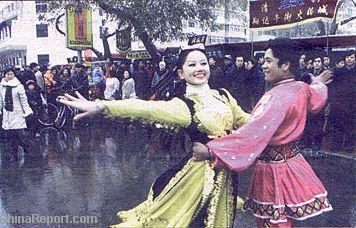 The Hui, due to their special history, are the only Chinese Ethnic Minority who do not have their own language. As such, the Hui converse in Han Chinese. The Hui have a long agricultural history and a cultural heritage encompassing substantial bodies of literature, art and religious classics. Security at this Building was not perticularly tight. 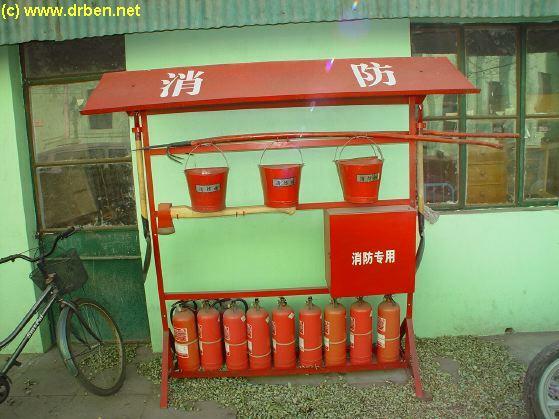 As at any important Official Building in China there is a Guard House manned at all Times. Guard my harmless intentions of shooting a few Digital Photos, I was let in for , so I was told with care, only a few photos. Eversince the September 11 2001 attacks in the United States, the Chinese Communist rulership has had more international leverage to crack down on unwanted Muslim elements like presumed rebellious Uygurs. It is possible that here-in lies a reason for the very high and rather intimidating Police Security at the Main Gate of the Niu Jie' Mosque during our 2002 visit. However, as security was High everywhere around Beijing, and not so much at this 2nd building, the Religious Headquarters Administrative Building, this may have been coincidence and not mean anything. Official Religious Worship in China , must be endorsed by the State and comply with the Communist Party Leadership. In this sense religious freedom does not exist in China, especially not for "Foreign" Religions. However, during the Cultural Revolution Era, Buddhism and Taoism also suffered immensely. In general terms worshipping is not much of a problem in China today as long as it is not tied to political activities and ideas subverting the Chinese State. 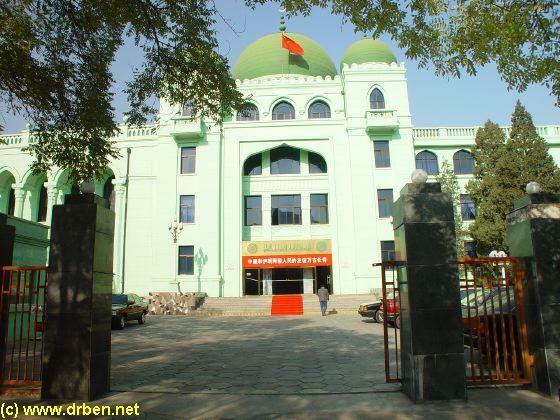 The Chinese National Headquarters and administrative Building of the Hui Ethnic Minority Group. Some of the sources used in this report. 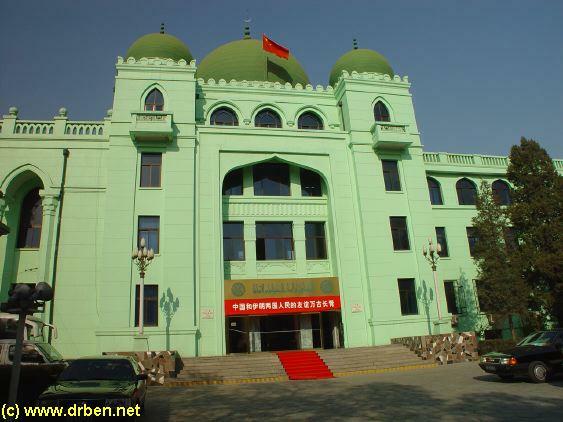 The Hui ethnic minority Islamic Headquarters of China, near Niu Jie Mosque.